In 2007, Chandra X-Ray astronomers captured an image of more than a thousand supermassive black holes, giving scientists a snapshot of a crucial period when these monster black holes are growing, and provide insight into the environments in which they occur. The black hole panorama was made with data from NASA's Chandra X-ray Observatory, the Spitzer Space Telescope and ground-based optical telescopes. The black holes in the image are hundreds of millions to several billion times more massive than the sun and lie in the centers of galaxies. Material falling into these black holes at high rates generates huge amounts of light that can be detected in different wavelengths. These systems are known as active galactic nuclei, or AGN. Instead of staring at one relatively small part of the sky for a long time, as with the Chandra Deep Fields — two of the longest exposures obtained with the observatory — and other concentrated surveys, this team scanned a much bigger portion with shorter exposures. Since the biggest black holes power the brightest AGN, they can be spotted at vast distances, even with short exposures. "With this approach, we found well over a thousand of these monsters, and have started using them to test our understanding of these powerful objects," said co-investigator Christine Jones, of the Harvard-Smithsonian Center for Astrophysics (CfA) in Cambridge, Mass. The new survey raises doubts about a popular current model in which a supermassive black hole is surrounded by a doughnut-shaped region, or torus, of gas. An observer from Earth would have their view blocked by this torus by different amounts, depending on the orientation of the torus. According to this model, astronomers would expect a large sample of black holes to show a range of absorption of the radiation from the nuclei. This absorption should range from completely exposed to completely obscured, with most in-between. Nuclei that are completely obscured are not detectable, but heavily obscured ones are. "Instead of finding a whole range, we found nearly all of the black holes are either naked or covered by a dense veil of gas," said Hickox. "Very few are in between, which makes us question how well we know the environment around these black holes." This study found more than 600 obscured and 700 unobscured AGN, located between about six to 11 billion light years from Earth. They were found using an early application of a new search method. By looking at the infrared colors of objects with Spitzer, AGN can be separated from stars and galaxies. The Chandra and optical observations then verify these objects are AGN. This multi-wavelength method is especially efficient at finding obscured AGN. "These results are very exciting, using two NASA Great Observatories to find and understand the largest sample of obscured supermassive black holes ever found in the distant universe", said co-investigator Daniel Stern, of NASA's Jet Propulsion Laboratory in Pasadena, Calif. The Chandra image is the largest contiguous field ever obtained by the observatory. 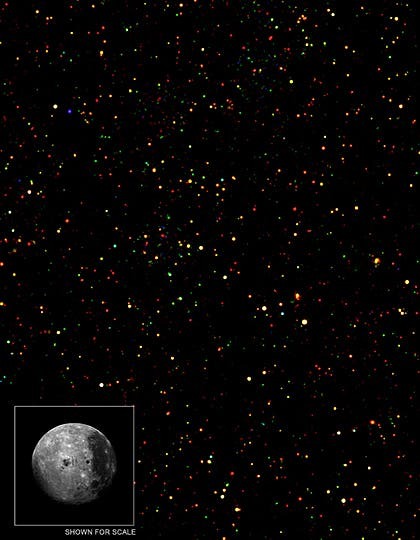 At 9.3 square degrees, it is over 40 times larger than the full moon seen on the night sky and over 80 times larger than either of the Chandra Deep Fields. This survey, taken in a region of the Bootes constellation, involved 126 separate pointings of 5,000-second Chandra exposures each. The researchers combined this with data obtained from Spitzer, and Kitt Peak's 4-meter Mayall and the MMT 6.5-meter optical telescopes, both located outside Tuscon, Ariz., from the same patch of sky.